FREE ARTWORK - FREE REVISIONS - FREE MOLDS - FREE SHIPPING TO THE U.S.
Trading Pin Junction now offers trading pin collecting bags. We offer the finest quality trading pin bags in the industry, and at the industry's lowest possible pricing. These high quality pin bags are designed to last, using heavy duty construction techniques while allowing storage for up to 400 trading pins. 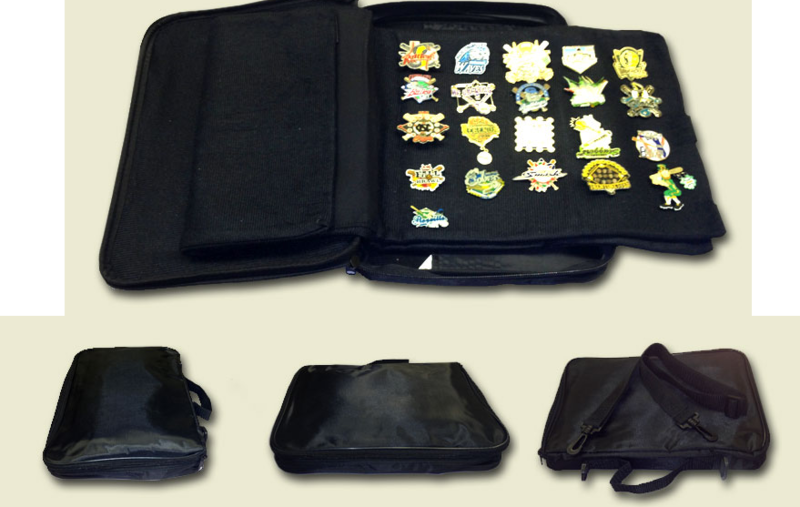 Protect and proudly display your valuable trading pins for years with one of these great looking collecting bags. Order a trading pin bag for each member of the team and save. -Approximate Size (Outer Dimensions): 9" x 12"
-Contains (3) 8.25" x 10" Pagest that unfold to 10" x 13"
-Soft cloth divider pages to protect your trading pins. -Shoulder Strap included for portability during trading. -Extra zipper storage compartment inside for other items. -Large capacity allows room for your collection to grow. At The Trading Pin Junction you can count on free artwork, free revisions, free mold fees, and Free Quotes. You will generally see a proof within a matter of hours after submitting your information in the Free Quote form. Let our fully staffed professional graphic art team assist you with the design of your custom trading pin. Just click on the Free Quote button located at the top of our website to get started. Fill out the form and attach any artwork and design ideas you might have. One of our designers will take your information and e-mail you a full color digital proof showing you exactly what your custom trading pin will look like. Once you have approved the artwork proof, just give us a call at 855-471-6747 and one of our customer service representatives will help you finalize your trading pin order. Once the order is finalized you can expect your lapel pins to be delivered to you in 14 days or less while not in our busy season. We look forward to hearing from you and manufacturing your custom trading pins. Volleyball - Tennis - Cheerleading - and more!